We arrived in Vancouver about 1:00pm on Friday and immediately searched for a good Chinese restaurant for what I assumed would be my last Chinese food for the week. We arrived at our chosen restaurant to find hardly a soul inside, but right next door was another Chinese restaurant filled with only Asians. This was the place. We ate a lunch of dim sum and roast duck at Tai Tung Seafood Restaurant on Granville Street. Delish. Back into the car we went, driving another 15 minutes to Granville Island where we met up with our friend Marcel who is joining us for the trip. Marcel lives just minutes away from where the boat is docked and was tasked with procuring all of our bulky items that, as it turned out, would never have fit in our car. We unloaded the car, Chris and Marcel met with the charter company to go over the boat, and the girls and I made our quick trip through the Granville market to purchase our fresh vegetables. When we returned the boys went off to Marcel’s to pick up the supplies he had purchased and I set off to unpack everything. The boat did not disappoint. It is large enough, but let’s be honest, it could always be larger. 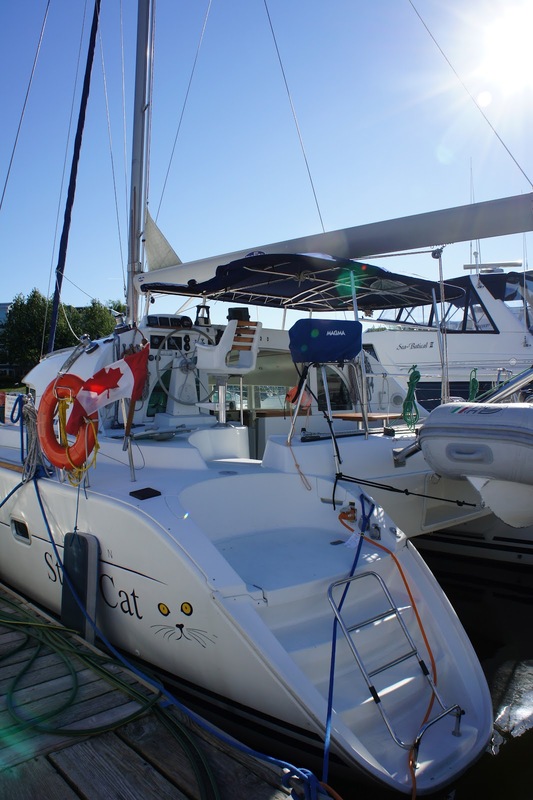 We dreamt momentarily about the 50 foot catamaran we had been on several years ago, but no room in the budget for that on this trip. Six o’clock rolled around rather quickly, and after a “that was a lot of work” drink, we walked to dinner at Bridges. Stella had calamari, Marcel had a salmon burrito, I had crab and halibut cake burger and Chris and Maggie shared nachos and four cheese pizza. After dinner we walked to a convenience store for more ice and then back to the boat and bed. Our first day and so far, all was looking fine. It was sunny and hot and we may be lucky with good weather ahead. I want to be Marcel!